Blessing Shells: Each member of the congregation and wedding party is given a sea shell to hold representing their unique individuality and their presence at the wedding. 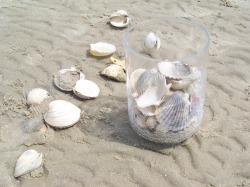 During the ceremony, the officiant will ask each person to make a special silent blessing or wish over the shell after which the shells are collected into a decorative container symbolically joining family and friends, through the couple, into one. The shells become a reminder to the couple of those who shared their wedding day, and who gave their blessing to them. Blending of Sands: This ceremony symbolizes the joining together of the couple, and the blending of their families and friends. This ceremony may be adapted to include children, and is especially meaningful as it symbolizes the creation of a new family. Unity Candle: Lighting the Unity Candle like the blending of sands, symbolizes the joining together of the separate lives of the couple, their families and friends. Please note that Unity Candles do not work well in outdoor settings! Blessing of Hands: A beautiful ceremony that blesses the hands of both the bride and the groom, as it looks forward to the events that will shape their lives and love. Handfasting: Most ancient cultures had some sort of "binding" ceremony for weddings. The ceremony (before weddings were mandated to be held in churches, and recorded with the government) "bound" the two people and their families together. The Old Norse called it a "hand-festa," meaning, "to strike a bargain by joining hands." This is where we get the custom of shaking hands. Handfasting was traditionally a very simple ceremony – the bride and groom faced each other and joined right hand to right hand and left hand to left hand and Knots were tied over and around the hands of the couple, thus ensuring them health, happiness and fertility. The expression "Tie the Knot" came from this early Celtic marriage ritual. There are many variations when it comes to Handfasting ceremonies. Some use just one single cord or piece of cloth representing the clan or with other special meaning. Another is a six-corded ceremony. This handfasting ritual can be customized to fit your needs and desires. It is your wedding and should reflect you, your traditions and beliefs. Couples who feel that it is bad luck to untie the cords may choose to purchase the cords in order to keep them tied. 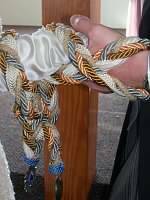 When you do this, you will receive the cords in a keepsake container, as well as a special handfasting certificate. We did not have a traditional ceremony or request and Paula did not blink. She was responsive, provided suggestions, listened to our input and understood what we needed. She centered it around our requests and went with the flow. We live in another state and wanted a certain date to be our anniversary but did not have time to do all the legal stuff so we did a commitment ceremony using a handfasting ritual. Paula was familiar with that and its history. She was able to come to the beach where we were staying and conduct the ceremony. She incorporated our narrative and vows into a nice pamphlet for us to keep and brought a beautiful box for us to store the cords used in the handfasting in. She also provided us with a professional looking certificate about where, what and when that she signed. We didn't have a photographer but she took some pictures for us and took some with her camera and put them on shutterfly for us to access. She was friendly and down to earth and just what we needed. I know from some of the materials she shared to give us ideas that she has officiated fully traditional weddings too. I have no hesitation in recommending her. They 'tied the knot' in a handfasting ceremony. 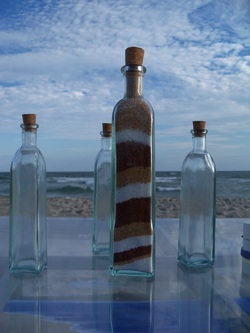 If you should choose either the Blessing Shells or Blending of Sand ceremonies and do not wish to purchase the supplies (shells, sand, containers) yourself, they will be provided for an additional fee. If you choose to do the Handfasting Ceremony, and wish to keep the cords, there is an additional fee. If you wish to add a rehearsal to either Package One or Two, there will be an additional fee of $100.